Mrs. Kathleen Moss is a Management Consultant and Chartered Business Valuator with Sierra Associates, an independent advisory and business valuation firm, which she established in 1993. She was appointed to the Board of the Jamaica National Building Society (JNBS) in November 2012 and was appointed Chairman of the JN General Insurance Company (JNGI) Board in January 2015, having served on the JNGI board since 1996. 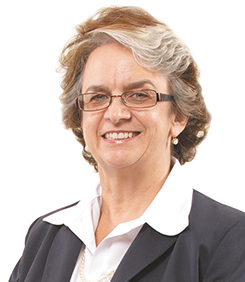 Mrs. Moss has been a member of the JN Audit and Finance Committees since their inception in the mid-1990s. On February 1, 2017, Mrs. Moss was appointed a director of The Jamaica National Group, the JN Financial Group and JN Bank and remains a member of the Audit and Finance Committees of The Jamaica National Group, JN Financial Group and JN Bank. Mrs. Moss serves on the boards of Jamaica Producers Group, Assurance Brokers Jamaica Limited, Pan Jam Investment Limited and Kingston Wharves Limited. She serves on the Executive Committee of Jamaica Producers Group and chairs the audit committees of Jamaica Producers Group and Pan Jam, the Compensation and Leadership Development Committee of Kingston Wharves and the Governance Committee of Pan Jam. Prior to establishing Sierra, Mrs Moss worked with the consultancy practice of Price Waterhouse. She is a trustee of the Violence Prevention Alliance and is Chairman of the Finance Committee of the Archdiocese of Kingston. She is a member of the Canadian Institute of Chartered Business Valuations and a graduate of The University of the West Indies and McGill University.